The lessons taught from raising two girls and trying to find stride as a mom. One thing I have become particularily obsessed with is the idea of chalk paint being used on various items. I must admit, I have a problem. I am addicted to Pinterest. I have been known to look for a recipe and the next thing I know it is an hour later and I am no longer looking for a stromboli recipe, instead I am sending quirky e-cards to my friends. I definitely like the crafting and DIY sections and the inspiration it gives me, the not-so-crafty individual. Now one thing that I have overcome since becoming a mother is the need for everything to be in its designated place at ALL times. That, however, does not by any means make it ok that my bathroom closet is a disaster area. I will not bore you with the details of everything I went through, get rid of old medications, sheets that fit beds we no longer use, etc. I will tell you though that I needed organization! 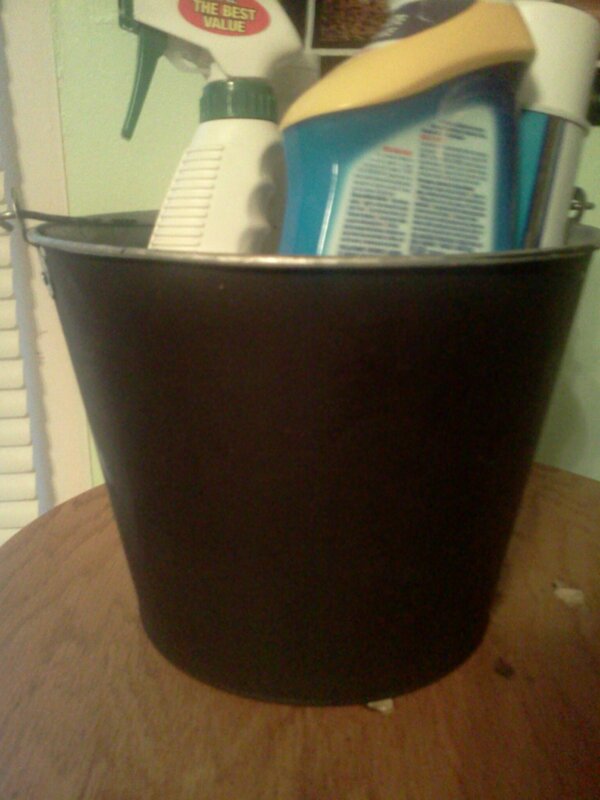 I also loved the idea of having a bucket designated to just bathroom cleaning supplies to access easily (thank you Pinterest). Here comes the part where I tie in my love for chalk paint. I started out with the tin buckets that my love got for FREE at the bar and grill he works at because they were throwing them away. 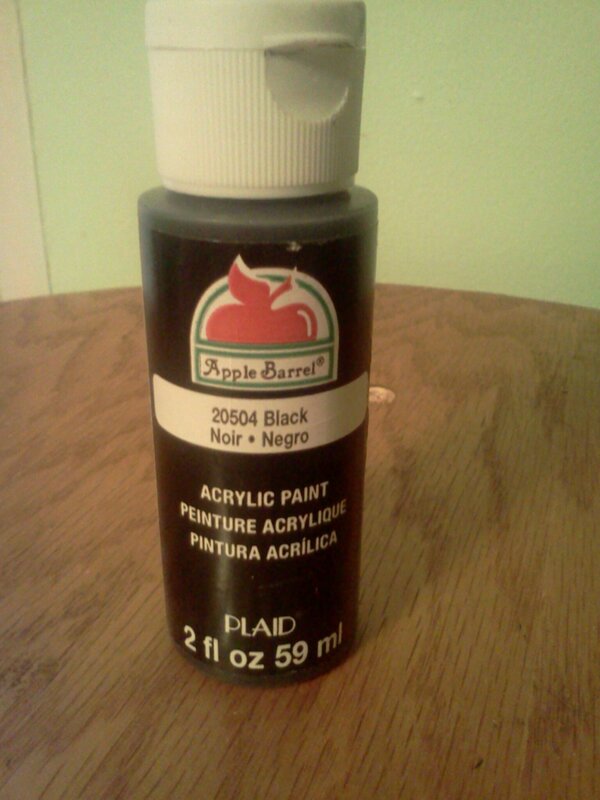 I then bought acrylic paint from Walmart for 97¢, and used brushes I had on hand. 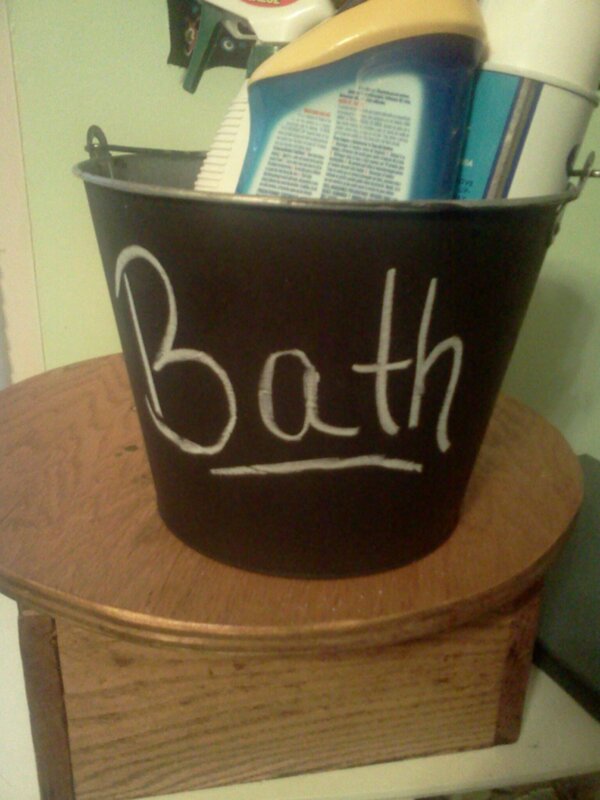 Now originally I was not planning on these buckets having the chalk paint characteristics and was just going to paint the name on them with a different color. As it turned out though, between the tin from the buckets and the acrylic paint, my buckets turned out to be perfect chalk boards! Now I can erase them easily with a wet towel and have all of my supplies organized! They turned out better than I had anticipated and could not be happier. Plus the added bonus of the organization makes them even better!